Saturday, as you'll surely need no reminding, is International Circus Day. Author Jeremy Clay delves into the Victorian newspaper archives to unearth a tale of a travelling menagerie, an escaped lion, and a Welsh holidaymaker on a spa stay that proved rather less than stress-free. In the drawing room of a hotel in sedate Llandrindod Wells, Mr TJ Osborne is preparing to head home from a pick-me-up break in the Welsh spa town. It's a June afternoon. The day is warm. The window is open. A fully-grown African lion leaps in. In the lively few minutes that follow, Mr Osborne gets a crash-course in lion-taming and later becomes the hero of a pithy write-up in the newspapers. Well, some of them at least. 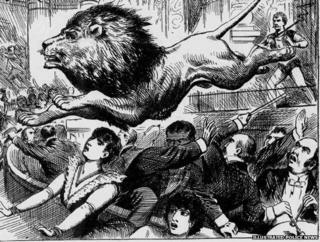 A holidaymaker tackling a lion in Llandrindod may seem to us now - as it must have to Mr Osborne then - a remarkable turn of events, but it doesn't seem to have caught the imagination of many of the news editors of 1889. Perhaps they'd just grown weary of printing variations on a well-worn theme. In the 19th Century, ferocious beasts roamed the British countryside once more, thanks to the lax security of travelling menageries that criss-crossed the nation in the style of incontinent mice, leaking wherever they went. In Nottingham, a tiger was found lurking in an orchard. Over the county border in Leicestershire, two elephants cheerfully demolished a back garden in Market Harborough. In Burton, brewery workers at Bass formed a human cordon as an escaped kangaroo boinged through the town. Time and time again in the newspapers of the Victorian age, something alarming is at large in a place nature never intended it to be. Back at the Bridge Hotel in Llandrindod, Mr Osborne would have needed no persuading of the general newsworthiness of his predicament. His spa-stay serenity already a fast-fading memory, the grocer from Neath had grabbed a chair, and was braced to defend himself as best he could, for as long as he could, "in what appeared to him an inevitable and terribly unequal struggle for life", in the words of the Western Mail. At that point, the lion's erstwhile keeper and his assistants arrived breathlessly on the scene, after dashing from the site of Wombwell's Menagerie, which was parked up on land by the hotel. "My God sir, don't move an inch," hissed the keeper, "or your doom is sealed". It was a tall order, given the circumstances, but Mr Osborne obeyed, standing stock-still as the lion paced the room in an evidently agitated mood. Slowly, carefully - sweatily too, no doubt - the keeper and his staff closed in on the creature. Taking a collective deep breath, they flung a sack over its head and secured it with ropes. Mr Osborne was saved, out of danger and completely unharmed, if you discount the damage to his nerves. And, as the Western Mail put it: "It is to be feared that this unexpected and exciting meeting with the king of beasts must to some extent neutralise the benefit of his brief respite from the exacting cares of his large business." Still, at least he wasn't stuck for anything to write on his postcards. Discover more about what life was like in Victorian times and 10 truly bizarre Victorian deaths.